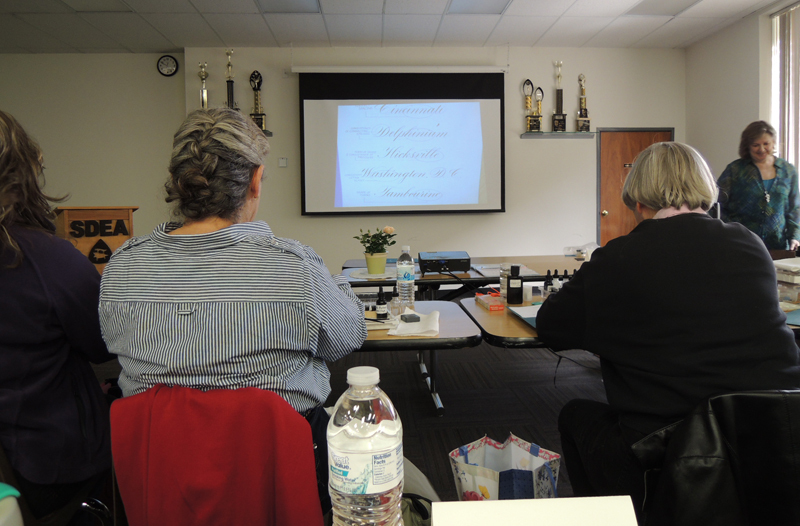 Getting ready to start the Copperplate workshop. Pat is standing in the far right. 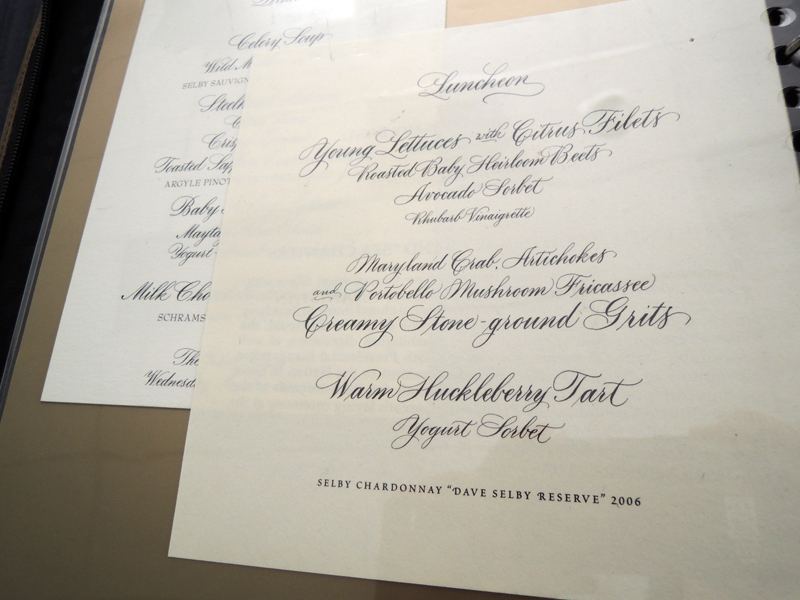 I had a wonderful opportunity over the weekend to visit beautiful San Diego, which is about a 2-hour drive south of Los Angeles, to attend a two-day workshop with Pat Blair, Master Penman & Chief Calligrapher of the White House. 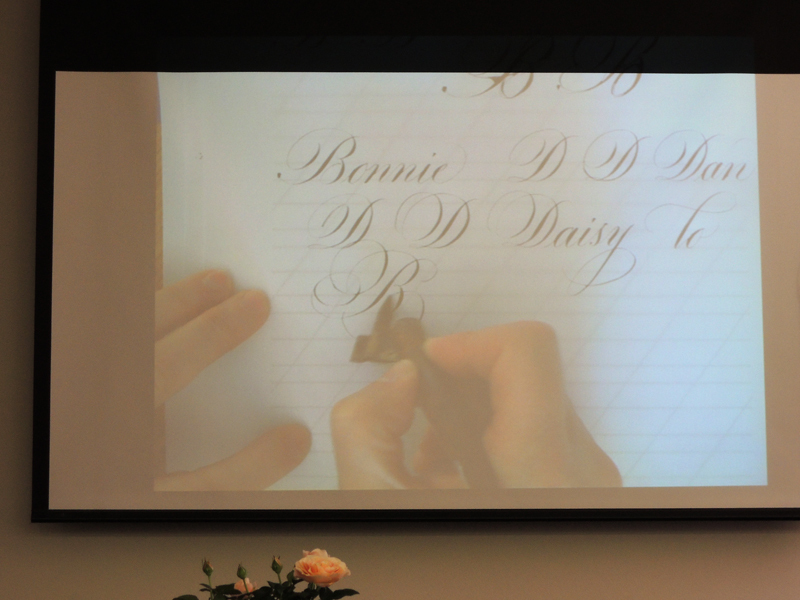 The San Diego Fellow Calligraphers invited her to teach the workshop, and extended the opportunity to members of the Society for Calligraphy. I heard about it through my teacher in mid-January and emailed Rose Smutko, SDFC’s Board of Directors Workshop Chair, to ask for more information. Lo and behold, she told me there were only two spots left! 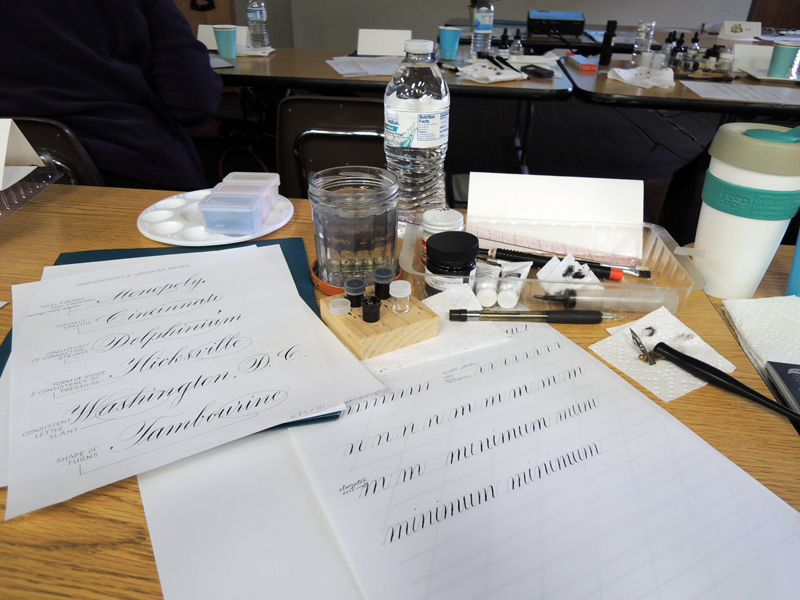 I signed up as soon as I could – how could I miss the chance to spend two days doing nothing but copperplate with a room of calligraphy enthusiasts, and most of all, with Pat Blair! We began Day One by doing the basic strokes for miniscule (lowercase) letters. It’s been a while since I really did Copperplate, so it was great to warm up and get re-acquainted with the beauty of this classic style of pointed pen calligraphy. Pat would demonstrate the letters in groups that are similar, then have us practice on our own while she walked around to give us individual attention and feedback. She is a wonderful teacher who explained everything very clearly and showed us a lot of great tips. After much concentration and writing for nearly six hours the first day, I was really tired by the end of the class. I was really glad my husband went to San Diego with me because we were able to just hang out and have a simple dinner, then relax and watch TV in our hotel room. 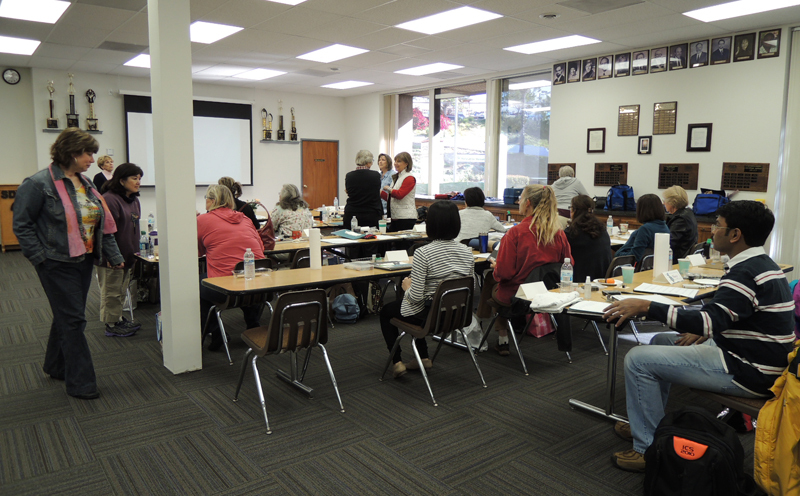 I was so glad to meet members of the SDFC and SFC who drove down to attend the workshop. Rose did such a great job coodinating the workshop and provided us with hotel information, restaurant recommendations, and delicious snacks and treats for when we needed a recharge. Thank you Rose! On the second day, we started with the majuscules (uppercase) letters. The majuscules are definitely more challenging and require much more concentration and attention. The compound curve was especially difficult! It takes so much control to make it look just right. When combined with lowercase letters, everything just looks so beautiful, especially in Pat’s hand. I loved watching her write! 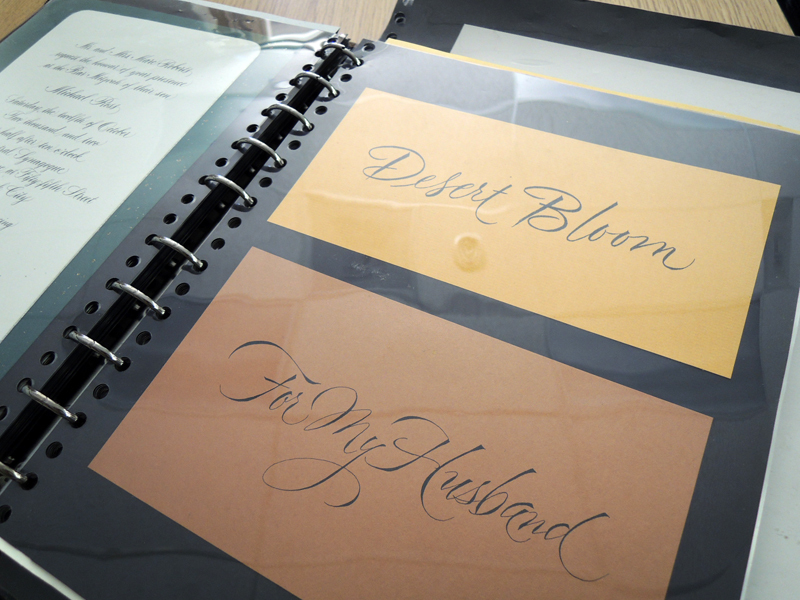 Pat was kind enough to bring her portfolio to the workshop to show us a variety of work she has done over the years, for clients and also for the two administrations she has worked for. It was wonderful and truly inspiring to see her beautiful work! 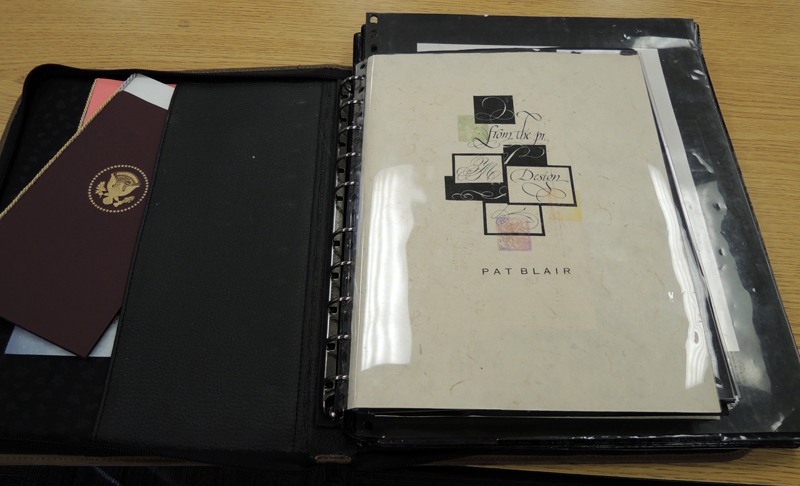 Pat gave us each a folio with handouts, and calligraphed our names on the folio. This will always be treasured! 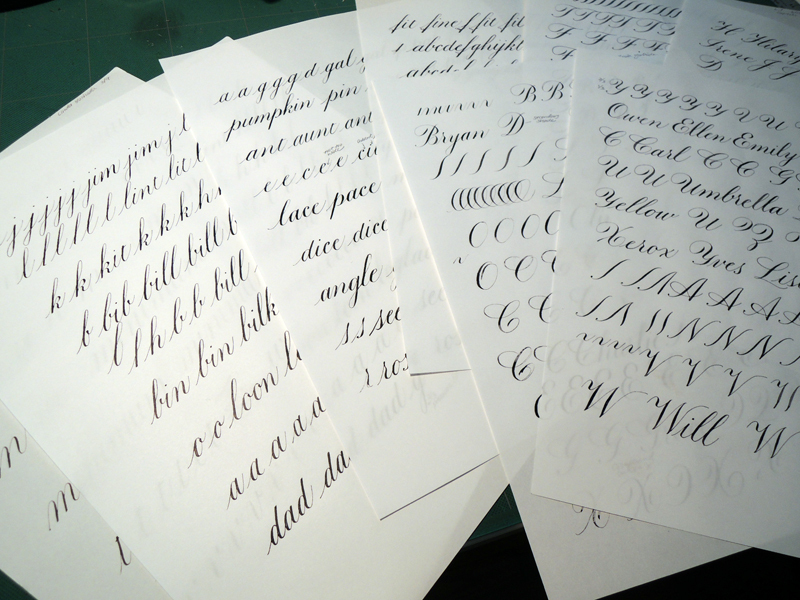 After spending two days with Pat Blair and other copperplate enthusiasts, I am more inspired than ever to become better! 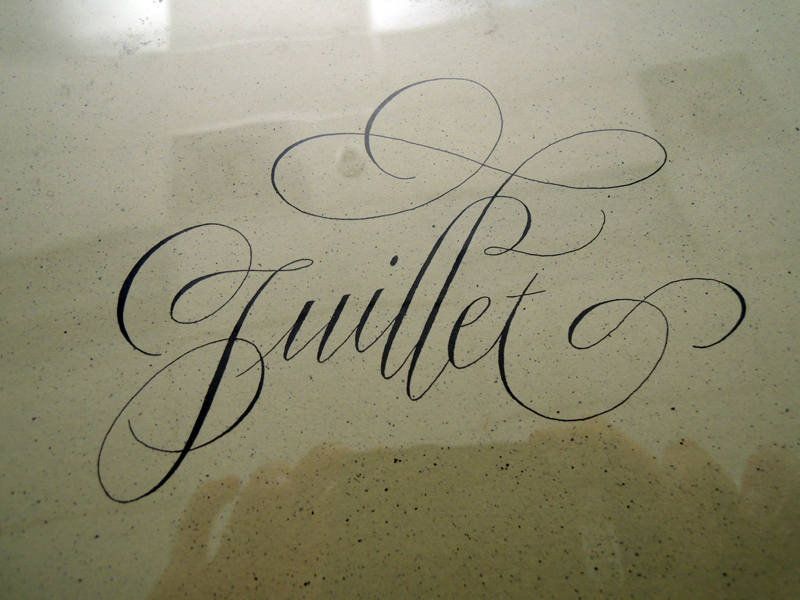 It’s the hand I was drawn to the most, and made me want to become more serious about calligraphy. Thanks to Rose and SDFC for the wonderful hospitality, and Pat Blair for taking the time to generously share your knowledge with us, and for the inspiration! 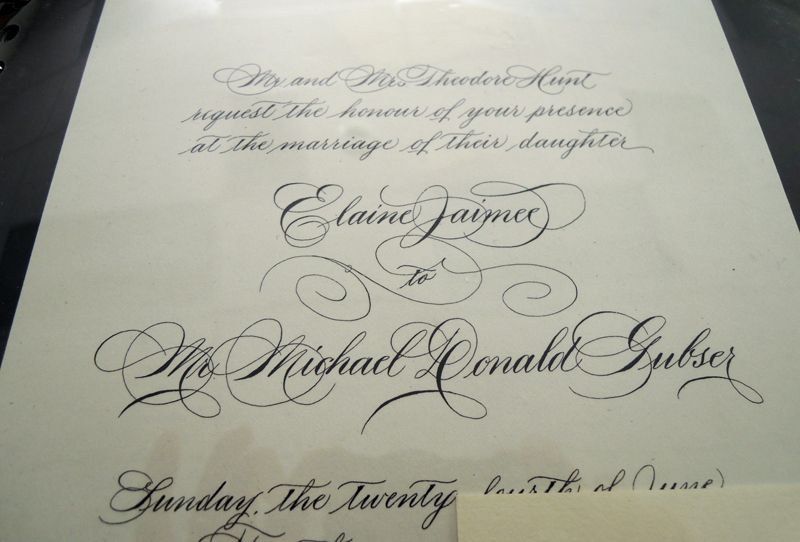 This entry was posted in The Learning Process and tagged copperplate on March 11, 2013 by linda. Hi Bill – Pat will be teaching at Letters California Style in February 2019. 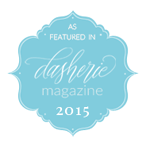 Check http://societyforcalligraphy.org for more info.